BOSTON, Mass. /Massachusetts Newswire/ — Today, Mass. Governor Charlie Baker and Secretary of Public Safety and Security Dan Bennett announced the release of $5.7 million in competitive grant funds to communities and local partners to bolster their efforts combatting gang violence. The awards were made to 15 communities and 11 research partners through the Shannon Community Safety Initiative, which targets gang violence in the Commonwealth. 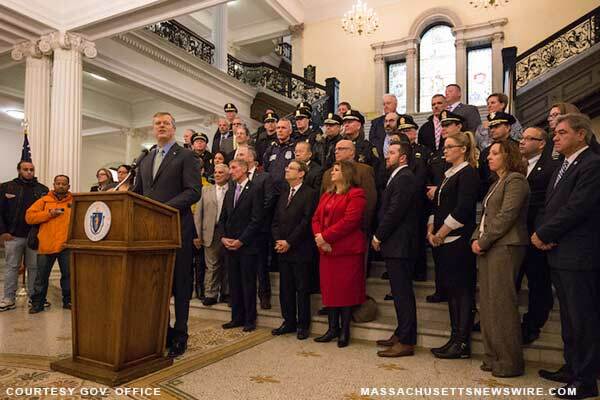 CAPTION: Governor Charlie Baker announces Shannon Grant awards during event at the Statehouse in Boston. Behind him stand legislators, local officials, members of law enforcement (including Boston Police Commissioner William Evans), and other stakeholders. Courtesy Gov. office/website. University of Massachusetts, Lowell (Lowell Site) – $ 49,980.40.